Much like Ozzy Osbourne, Motley Crue was introduced to me at an early age. Motley had a huge impact and their influence could be seen throughout my neighbourhood, which seemed to transform overnight when Crue hit the airwaves. 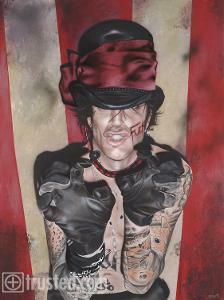 While all members of the band make excellent subjects, it is the celebrity of Tommy Lee that embodies the carefree attitude of Rock and Roll in the 80s. To say Tommy’s life has been somewhat of a circus would be an understatement – so I could not pass up the opportunity to paint Tommy in this state, which I believe embodies all the characters that make up the Tommy we have all come to know.